We’re going all pumpkin around here lately. I guess all that puree stored in the freezer is weighing on my mind. Here’s one of the ways I’ve been using it up. 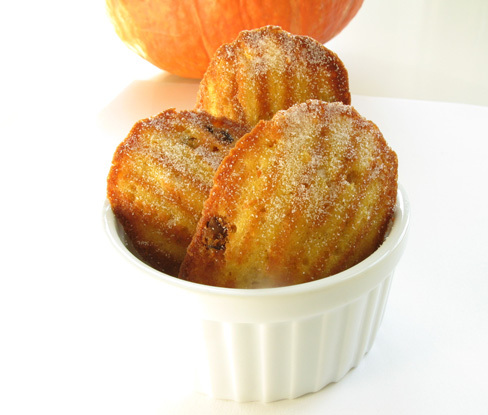 These pumpkin-pecan madeleines are flavoured with brown sugar and browned butter, which adds a richness that perfectly complements the pumpkin. It took me three tries to get this recipe down. The first time they didn’t rise high enough, the second time I added vanilla (I discovered that it just got in the way) and I forgot to butter the tins. Finally, on the third round, everything aligned. These little cakes are hardly madeleines anymore, what with the pumpkin and the brown sugar and the crunchy, candied nuts, but they’re so pretty, and I love how their edges get nice and crispy when they’re baked in a madeleine tin. I also highly recommend the browned butter method for combination with pumpkin. It’s a deep flavour that goes perfectly with brown sugar. -If you don’t have a madeleine tin, I think these would work as mini-muffins instead. -Grease your tin really, really well. If you don’t, your madeleines won’t brown nicely AND they won’t come out of your tin. -Candying (and in fact, even toasting) the pecans is optional, but I like it because the madeleine batter is not very sweet. -If you use canned solid-pack pumpkin instead of homemade puree, I recommend mixing it with your melted butter before adding it to the batter. This should soften it enough to make it easy to incorporate. -I added some baking powder to the recipe because my madeleines didn’t rise as much as I would have liked (as I had to cut back on butter in order to add pumpkin). If you have a way to cut the baking powder, let me know. First, do your preparation: preheat your oven to 350. Chop the pecans and sift the flour and baking powder together in a small bowl. Next, melt your butter in a small pan over medium heat. It will froth up, then reduce again as it begins to brown and turn a rich nutty colour. When it is brown, pour it through a fine-mesh strainer (this gets rid of any solids that might have formed) into a small bowl. Set the browned butter aside to cool as you prepare your pecans and batter. In the same frying pan you used to brown the butter, toast the pecans with a teaspoon or so more butter. When they are getting golden, toss approximately 2 tsp. of brown sugar in and stir the pecans to coat them well. Remove them from the pan and set them aside to cool. To prepare the batter, first beat the two eggs together with a pinch of salt. You can use a standing mixer if you’ve got one (lucky you! ), a handheld electric mixer (this is what I did), or if you’re tough, do it by hand. Beat the eggs until they’re pale yellow, thick, and syrupy. They will also have gained some volume. Next, beat in your brown sugar, adding it in large pinches to the eggs while you continue beating. When all the sugar has been incorporated, continue beating until your mixture has gained even more volume and holds the marks of the beater for a few seconds (like softly-whipped cream). After you’ve beaten the eggs, sprinkle the flour overtop and gently fold it in with a spatula. Don’t be rough and overstir, but don’t be afraid to be firm with it either. Next, fold in the butter and pumpkin, ensuring they are well-incorporated. Finally, fold in the pecans. Put the batter into your (well-greased!!) madeleine tin, a big tablespoon for each little mold. Most of the madeleines recipes I consulted said that the batter would spread in the heat of the oven, but I didn’t find this to be true. Instead, I used the back of a spoon to spread the batter evenly in the molds. I filled the molds approximately 3/4 full, maybe a little bit more. I had exactly enough batter for 12 madeleines. Bake your madeleines for 12-15 minutes, turning the pan once halfway through cooking to ensure they brown evenly. They will be golden and springy when they’re ready. Once you remove them from the oven, cool your madeleines in the tin before popping them out and eating them. Try them with tea or coffee. Yes! Another recipe to drag out my madeline silicon mould that I’ve used only twice in the last 5 months. How did u make your pumpkin puree? Can i ask a silly question, how did u photograph the background so that it looks all white? I know some people photoshop but there is there a way without editing? As for the photography… we’re amateurs with photoshop, so I wouldn’t even know how to add in a white background. We have a white table (that’s the off-white you see in the background), and I just set the madeleines on a white sheet of paper (that’s the bright white you see in the foreground). Taking the photo slightly from above means that you only see white instead of the messy living room around the madeleines! Patricia, Thanks! It took three tries, but I’m really happy with the recipe now. Any idea how these would be without the pecans? My wife doesn’t like nuts but these look good. Matt, I think they’d be fine without the nuts! Maybe up the sugar just a little (like a 1/4 cup packed instead of loosely packed). I just tried to make these today and let me ust say yum!! Although I thought that the batter seemed looser than other madelein recipes i’ve used, it turned out to make them a lost softer. I’ll definitly be making these again. I’m so glad you liked them! And thanks for the reminder, too. I’d forgotten about these, but it’s getting to be just the time of year to whip up a batch. It is a pretty loose batter, isn’t it? It’s the moistness of the pumpkin, I guess. I hadn’t thought of it, really, but at least it’s a good excuse for not getting that perfect pretty bump on the madeleines’ bellies.